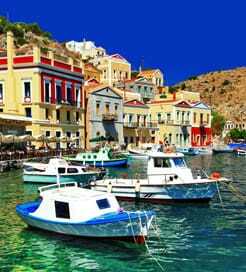 There is no shortage of options to choose from when it comes to selecting a ferry from Skopelos Island to Greece. There are 4 ferry companies with a combined offering of 11 Ferry Routes connecting Chora (Skopelos) to Alonissos, Glossa (Skopelos) to Skiathos, Chora (Skopelos), Volos, Alonissos, Agios Konstantinos & Mantoudi, Chora (Skopelos) to Alonissos, Glossa (Skopelos), Volos, Skiathos & Mantoudi, Glossa (Skopelos) to Skiathos, Chora (Skopelos), Volos, Alonissos, Agios Konstantinos & Mantoudi, Chora (Skopelos) to Alonissos, Glossa (Skopelos), Volos, Skiathos & Mantoudi, Glossa (Skopelos) to Skiathos, Chora (Skopelos), Volos, Alonissos, Agios Konstantinos & Mantoudi, Chora (Skopelos) to Alonissos, Glossa (Skopelos), Volos, Skiathos & Mantoudi, Glossa (Skopelos) to Skiathos, Chora (Skopelos), Volos, Alonissos, Agios Konstantinos & Mantoudi, Chora (Skopelos) to Alonissos, Glossa (Skopelos), Volos, Skiathos & Mantoudi, Glossa (Skopelos) to Skiathos, Chora (Skopelos), Volos, Alonissos, Agios Konstantinos & Mantoudi & Chora (Skopelos) to Alonissos, Glossa (Skopelos), Volos, Skiathos & Mantoudi. The fastest route between Skopelos Island and Greece is Glossa (Skopelos) to Skiathos with a crossing duration of around 15 minutes. With so many routes on offer we make it simple by comparing all similar routes in one search so you can quickly find what you are looking for. Skopelos is part of the Northern Sporades island group located in the western Aegean Sea off the coast of Greece. Regarded as one of the most attractive islands in the country, Skopelos offers a peaceful atmosphere and a landscape comprising lush pine forests, picturesque villages and a craggy coastline. In fact, the island’s stunning surroundings and clifftop church of Agios Ioannis Kastri were used in the 2008 film ‘Mamma Mia’. There are many walking trails that take you through the island’s green interior, too, where you’re likely to spot countless olive trees and plum groves, the fruits of which are commonly found in local dishes. 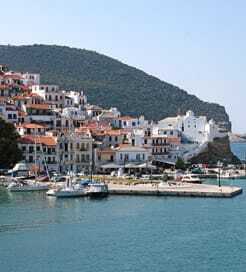 Skopelos has a couple of ports along its coast situated in Glossa to the northwest and Skopelos Town to the southeast, offering frequent sailings to the surrounding Greek islands and the mainland.